I think I've made it pretty clear in previous postings that I'm not a fan of standardization, but I realize that most teachers don't have a lot of choice and are required to teach to certain standards. Given that, teachers still often make choices about which standards they cover (since there's never enough time to cover them all) and how in-depth they go on each standard. Since my daughter is currently taking Algebra, I'm helping a home-bound student some with Algebra, and I occasionally teach Algebra myself, I thought I would pick an example from Algebra for my first (and perhaps last) "teach this, not that" post. I was recently helping that home-bound student with the polynomial unit in Algebra 1. She did some marginally interesting topics, but - since I get to cherry pick for this post - she also did an assignment that I'll excerpt below. Here's a screenshot of some of the problems she had to do. And here's a screenshot of the answers. Later in the semester she'll get to explore exponential functions a bit, so we'll see what types of activities she gets to do for those, but one typical way they could explore exponential growth would be a compound interest type of problem. Now, every teacher is different, but based on my experience, if an Algebra teacher has to choose one of these two things to cover in an Algebra 1 course, they often pick the first one. Why? Because polynomials seems to "fit" better in the Algebra 1 curriculum and exponential growth does not, and compound interest problems are often presented in a way that it's mostly just plugging numbers into a formula and computing an answer. From my perspective, however, it should be exactly the opposite. 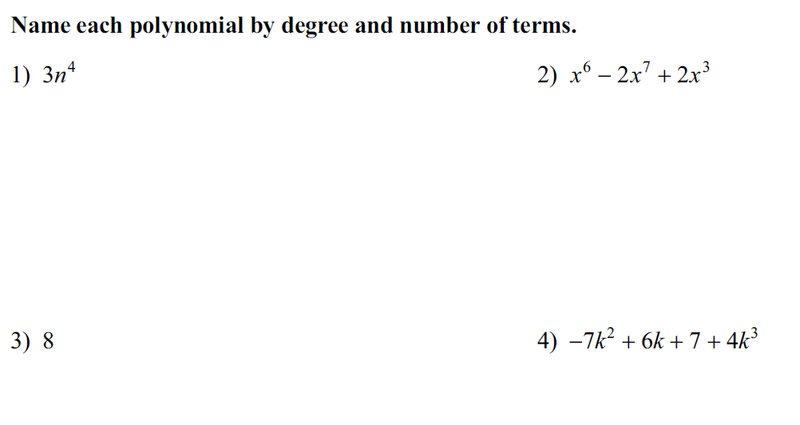 There may be some reason why some people might want to know that a certain polynomial is a quartic trinomial, but I have to think that for most of our students that's not a particularly good use of their time. Compound growth, however, is something that could be life-changing for them and their families (credit cards, car loans, mortgages, savings accounts, investments - and that's just financial applications), yet even when we do teach it, we often teach it as simply "plug-n-chug." Here are two problems that I think would be interesting for every high school student to explore (and probably most of the high school staff, for that matter). Scenario 1: Save for your retirement . . . before you graduate from high school. Many students in my school get a job in high school, often over the summer after their sophomore year. If they work full-time over the course of that summer, they could easily gross $3000. Now, being the teenagers that they are, they are most likely going to want to spend a fair amount of that money. And they should. But I would suggest that by exploring the mathematics a bit, they - and their parents - might also want to invest it. She won't owe any income tax on that low of earnings, so even though Roth IRA contributions are "after tax" contributions, this would effectively be "no tax" contributions for her, and all earnings will be tax free. Current assumptions (which I think will change, but we'll go with it), is that a current 16-year old might retire at age 67 or so, so we're looking at a 50-year + investment horizon. What will $3000 grow to in those 50 years? And there's the exponential growth question. So, what will $3000 grow to in 50 years? Well, to be sure, no one can answer that question, but we can estimate based on a lot of data from past experience. (This is assuming that the way economies and capital markets work will not dramatically change, which I think is perhaps not a good assumption, but for estimating purposes it's the best we've got.) Since 1930, the long term annualized return of the S&P 500 is about 9.7%. If our 16-year old would achieve that kind of return over 50 years, she'd have about $307,000 at retirement. Just from that one summer's investment. If she works after her junior and senior years and puts in an additional $3000 each summer, she'd be looking at over $900,000. But since we're talking about 50 years, I think we should at least consider investing in riskier equities that - over time - are likely to achieve a higher return. Since 1930 Large Cap Value has returned 11.2%, Small Cap has returned 12.7%, and Small Cap Value has returned 14.4%. Now, most folks would look at that and say that certainly the amount she'd have in the end would be higher, but I'm not sure they'd realize how much higher. Of course now would be a good time to talk with our student about inflation, and how that $7.5 million ($9000 for 50 years in Small Cap Value) in 2067 won't buy the same amount as $7.5 million today. So let's assume an average annual inflation increase of 3.5%. Lots of interesting discussions to have here about how students could use that information to calculate the end result but, simply discounting our returns by that amount turns that $7.5 million into about $1.99 million in today's dollars, which translates to being able to spend about $80,000 a year - (today's dollars) using the 4% rule. Still pretty darn good, which is why I think this is a worthwhile scenario to explore with students and why I think this might be a better use of time than learning about quartic trinomials. Scenario 2: Don't go to college . . . and retire much earlier. Yes, it's provocative, but that's part of what makes it interesting. I've written before about our assumption that college is the default goal for our students, but let's look a bit closer at the mathematics. Like most parents, I've paid attention to the tremendous increase in the cost of attending college. We also started saving for college even before we adopted our daughter, using a tax-advantaged 529 plan. We invested in Colorado's plan because, in addition to earnings and withdrawals being tax free, contributions are exempt from Colorado state taxes (which is like earning 4.63% right off the bat). Due to our diligent saving and investing, and the benefits of compound growth (even with 2008), we have about $120,000 set aside in our 529 for our daughter's college expenses. Well, that sets up an interesting scenario for a problem about exponential growth. What if she didn't go to college and, instead, invested that money now (we'll take a tax hit since it's not being used for college, but I'm willing to cover that), immediately got a job that didn't require a college degree, and continued to add to that investment over the years? Lots and lots of messy details here, which is why it's such a good problem situation to work through with students, but let's look at a simplified version with lots of assumptions just to get the feel for it. We'll use the same investment return information from Scenario 1, including investing in index funds with 100% in equities, since she's young and has a long investment horizon. We'll assume that she'll get a job paying at least $25,000 per year to start off with, and that each year she'll get a raise that's at least equal to inflation. We'll also assume that she'll be able to save and invest an additional $3000 each year. I realize that can be tough when she's starting at $25,000 per year, but that works out to a reasonable 12% of her income, and perhaps we'll let her live at home for the four years she would've been in college to help her start off. I'm going to make one more assumption, which is that she could retire comfortably on $40,000 per year. That's for just her, if she gets married she would obviously have additional income, additional investments, and additional expenses that would complicate it a bit; but as a family of three we are currently spending about that much (when you take away what we're saving for retirement), so I don't think it's an outrageous assumption for one person. Following the "Reality Retirement Plan" as described by Ty Bernicke, withdrawals after age 55 are reduced by 2-3% per year until age 76. Because you indicated a future retirement date (2045), the withdrawals won't start until that year. Your contributions will continue until then. The tested period is 30 years of preretirement plus 50 years of retirement, or 80 years. FIRECalc looked at the 64 possible 80 year periods in the available data, starting with a portfolio of $120,000 and spending your specified amounts each year thereafter. For our purposes, failure means the portfolio was depleted before the end of the 80 years. FIRECalc found that 0 cycles failed, for a success rate of 100.0%. You really should explore FIRECalc some more but, based on a lot of baked-in (but not half-baked) assumptions, it tells me that for the 64 possible 80 year periods that the historical data supports, not once would she have run out of money (and usually would leave quite an estate). Note that has her retiring at the age of 48 and living until 98. (If you want to change it to constant spending power instead of Bernicke's Reality, then you still have an 81.3% success rate. But working just 3 more years, so retiring at 51, would have had a 100% success rate.) Keep in mind all of this is assuming no pension or social security income, which you definitely would have if you worked for 30+ years. After playing around, you can even discover that she could retire in 2036 - so at age 39 - with a 97% chance of success (and with 59 years of retirement, and usually a sizable estate). So, at an age when some college graduates are still paying off their college loans, she could be retired. Provocative enough? FIRECalc even lets you download a spreadsheet based on your inputs that you could analyze with students to examine (and perhaps manipulate) the formulas. Again, I would suggest this is not only more interesting than quartic trinomials mathematically, but also practically for students. And, of course, there's nothing preventing our student from doing both Scenario 1 and Scenario 2. That's just two examples. Lots and lots more you could do with debt (credit cards, car loans, mortgages), governmental policy (budget, entitlements, social security, medicare), and on and on and on. But I don't know anyone that really does, because there's always one more standard we need to cover, and students just might get asked to name a quartic trinomial on some test sometime. It's probably a good thing, though, since we wouldn't want our students to be financially independent and able to retire before we can, would we? I read your blog and think to myself, "She and I would have a lot to talk about." I happened upon your blog while doing research for mine (a place where teachers could share ideas about different ways to teach literature. I appreciate your insights on education. My name is Jordan Sweat and I am a student at the University of South Alabama. I am currently in a class called EDM310 which requires us to create blogs and post to them regularly. We are also required to comment on other people's blogs all over the world, and this week I was assigned to yours. I have found your post to be very insightful, especially as a future educator.